(NASCAR)—Kevin Harvick has become the first four-time winner in the NASCAR Cup series this year, running away in the closing laps to beat teammate Clint Bowyer by more than 7.4 seconds. 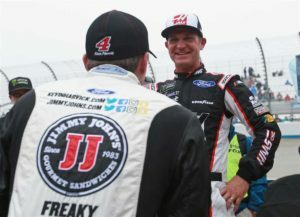 Harvick, who drives car number 4 for Stewart-Haas Racing got past Bowyer (right, talking to Harvick) on the 338th of the race’s 400 laps, leaving Bowyer to fend off Daniel Suarez, who finished a career-best third. Joplin’s Jamie McMurray ran a second-ten race all day and finished sixteenth. NASCAR’s next race is next Sunday at the Kansas Speedway, considered a “home track” for Bowyer, who grew up a short drive away in Emporia. Bowyer also has a home at the Lake of the Ozarks. (INDYCAR)—IndyCar drivers will prepare this week for Saturday’s race on the Indianapolis Motor Speedway road course and then turn their attention to making the Indianapolis 500 field the next weekend. Tony Kanaan, who won the 500 in 2013 was quickest in open testing last week with a top lap of 226.181, the best among the 21 cars and drivers who checked out the new aero package in near-competition conditions. He was the only driver over 226 mph. The fastest qualifier for last year’s race was Scott Dixon, who started from the pole at 232.164. Kanaan is one of six former winners of the 500 who will try to qualify for this year’s race. Also entered is three-time winner Helio Castroneves, who is likely to make his only IndyCar start of the year as he tries to become the fourth driver to win the race four times. Other past champions on the entry list are last year’s winner, Takuma Sato, the 2016 champion Alexander Rossi, and Dixon, and Ryan Hunter-Reay. Thirty-five drivers were entered, setting up the first real “bumping” during qualifying for the 33-spots in the field. But one of the 35, rookie Pietro Fittipaldi, suffered severe leg injuries in practice for a sports car race in Belgium and won’t be able to drive in the 500. Dale Coyne Racing is looking for a replacement. Fittipaldi is the grandson of two-time Grand Prix champion and two-time Indianapolis 500 champion Emerson Fittipaldi. (FORMULA 1)—Formula 1 returns to competition next weekend with the Grand Prix of Spain. F1 has announces some aerodynamics changes for next year’s cars that it hopes improves closer racing and more passing. Next year’s cars will have a larger, simpler front wing, a wider and deeper rear wing and changes to front brake ducting. The aero changes are in addition to other changes being considered for the series next year.